Reports of groundwater contamination have surfaced in several states across the U.S. in areas of oil and gas drilling. Unfortunately, in the absence of any pre-drilling characterization of the drinking water, it is difficult, if not impossible, to prove that drilling operations have impacted water quality. Baseline testing allows property owners to know exactly how clean the water is so that if water appears contaminated in the future, they can test it and compare the results to the baseline results. 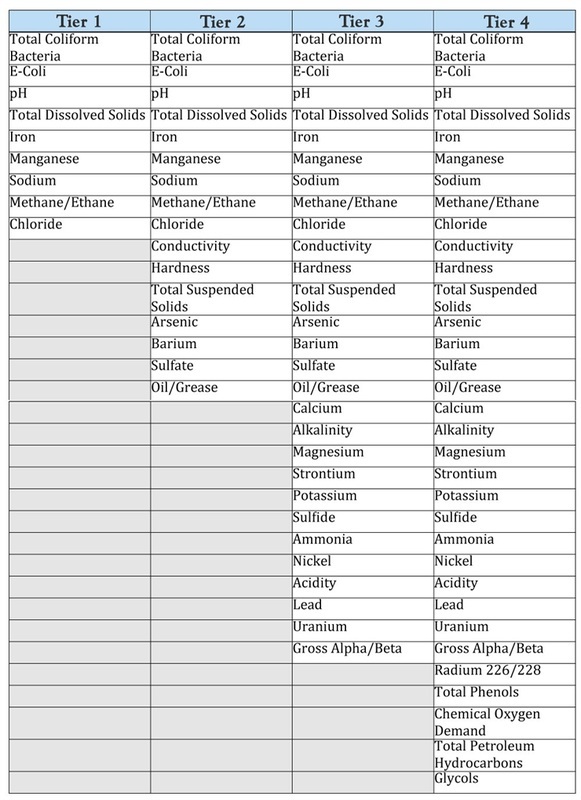 Many of the compounds that are potential contaminants from the drilling process are naturally occurring in varying concentrations, and, as a result, their mere presence following oil or natural gas drilling is not proof of contamination. Without baseline testing there is no clear, scientific way to establish that your water was affected by the drilling activity. The more you know about your well and nearby surface water quality the better off as a property owner you are at protecting your family and investment. Therefore, it is recommended to test a drinking well or surface waters before a natural gas or oil well is drilled in one’s area. Here are guidelines to assist property owners with baseline testing. Anyone who uses a drinking water well located within 2000 feet of an oil or natural gas drilling well pad should have their water tested. Owners of wells or surface water resources within 1 mile of a well pad should consider testing as well. Baseline water quality testing comes in many sizes. There are tests that will check for the minimum contaminants that can be associated with drilling and there are tests that look specifically for chemicals that are involved in the fracking process. It is recommended that you opt for the most complete water test you can afford to maximize legal protections. However, even basic testing is better than no testing as it can provide at least some level of protection. Examples of different testing tiers are below. Tier 1 represents essential parameters most likely to be effected in the event of contamination and can be tested at a reasonable cost. Tiers 2 and 3 include parameters that provide further indication of contamination by drilling activities. Tier 4 is a more comprehensive panel with some more costly parameters, but maximizes legal protection. Penn State Extension has a fact sheet that provides a description of many of the parameters above. Ultimately, the key to baseline testing is that it is conducted prior to any drilling or fracking activity so you are able to prove changes in water quality. It is essential to test for water quality prior to drilling activity to establish a baseline water quality, and at least once after drilling has been completed. The optimal time to conduct baseline sampling is before companies conduct seismic testing near your property. Seismic testing involves the use of either trucks or explosives to create vibrations that are read with instruments to map underground rock formations. These vibrations could, in rare instances, mobilize and introduce sediment to a nearby water supply or change water flow. Conduct baseline testing is when your property or nearby property has been leased for natural gas or oil drilling. Post-drilling water quality testing should be done within 6 months of completion of drilling and hydraulic fracturing. Property owners may wish to conduct post drilling sampling annually after fracking of a well in the area. Subsequent screening using general parameters such as pH, specific conductance, TDS, or dissolved methane can be a less expensive way to monitor into the future to see if changes occur. If there is a change in concentration or occurrence of parameters tested, conduct further more sophisticated testing. It is important to note that water quality will vary naturally due in part to season, rainfall, and local geology. Multiple tests, both before and after drilling, help to clarify the difference between contamination events and natural variability. While property owners are able to collect their own samples for analysis, test results from water samples collected by the homeowner are generally not recognized in legal proceedings because they are not independent. In order to use a water analysis in a litigation proceeding, there are several steps of the sampling process that have to be followed. Chain of custody identifies who sampled your water and all the hands that were involved. Chain of custody proves that the sample was taken properly, stored and transmitted properly as well as analyzed in accordance with the testing methods set forth in the Safe Drinking Water Act. For proper chain of custody and to meet legal standards, it is recommended that the testing be conducted by a state certified lab.